Roy Beggs MLA in the Carrickfergus Tesco store along with Trussell Trust volunteers. The important work of foodbanks in providing a "safety net" for the "most vulnerable" has been praised. Volunteers from Carrickfergus foodbank, which is operated by the Trussell Trust, held a neighbourhood collection this morning at the Tesco branch on Minorca Place. Stewart Dickson with Jill McIreavy and Pam Mewa at Tesco Carrick. Among those supporting the valuable work of the organisation were East Antrim MLAs, Stewart Dickson and Roy Beggs. “I am delighted to support the tenth year of the Neighbourhood Food Collection campaign. The partnership between Tesco, the Carrickfergus Foodbank, the Trussell Trust and Fareshare has helped provide millions of meals to people in need," Stewart Dickson said. “The work of the volunteers, Tesco staff, and the wonderful charity of customers, is very heartening at this time of year. “I am a great supporter of the Trussell Trust, which provides support and three days’ emergency food to more than 1.1 million people, including 400,000 children. “Such emergency support is even more crucial as the mean-spirited Tory cuts begin to hurt the most vulnerable and the welfare system is reformed, leaving many with periods of time with no income. We as a society need to show compassion, consideration and flexibility when benefit claims are being assessed in the first place." The Alliance Party MLA added: “Our welfare state is slowly but surely being pulled apart by cuts, mismanagement and ‘reform’ which are undermining its very principles of universal coverage and social security from cradle to grave. I see this every day, as more and more people who are in food crisis are coming to my office for assistance. 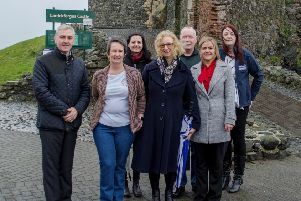 “That said, I was delighted to observe Tesco customers giving so generously, and to discuss the issues with Carrickfergus Foodbank volunteers Jill McIlreavy and Pam Mewa. "Just where would society be without those who are willing to give so freely of their time to assist those who are in need?" Urging shoppers to get into the Christmas spirit by donating items was UUP man Roy Beggs. “Foodbanks have become an important safety net for individuals between jobs or awaiting benefits and demand has been increasing," he said. "I would thank Tesco Carrickfergus and the local foodbank volunteers for providing a food collection point at this important time where demand for assistance normally increases. "The Trussell Trust advise that in particular if you can, please give tinned meat, tinned fish, tinned veg, tinned fruit, pasta sauces, instant coffee, milk (UHT or powdered), fruit juice (long life) tinned pudding, jam, instant mash potato and Christmas fare."